For future engineers who just got started with programming, we have free tutorials tailored for beginners. You can learn the basic concepts quickly and apply them to the games. All you need is a PC/laptop and a modern web browser such as Google Chrome, Microsoft Edge, Firefox or Safari. 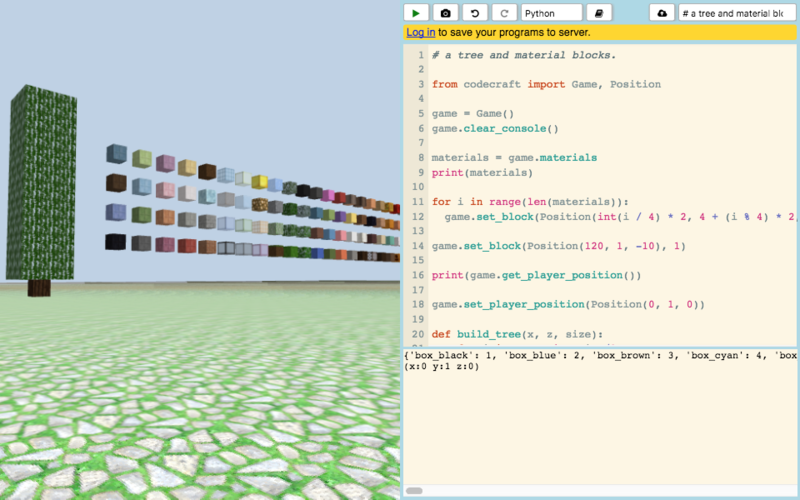 CodeCraft is a 3D game where players can write code to build a virtual world. Integrated coding environment. No need to purchase and/or install any software. Build your own 3D world with code. Make a playable game by responding to keyboard and mouse events. Follow online tutorials for beginners and experienced coders. If you are new to coding, we recommend starting with Python tutorials. This one hour begineer lesson teaches basic Python programming concepts using CodeCraft 3D game.